When I was about five years old, my mom and I went to the park one beautiful summer day. We played on the swings and jungle gym and then sat in the grass to relax before going home. While we sat there in shorts and t-shirts, legs extended, a giant bumble bee landed on my mom’s thigh. She didn’t panic, but rather explained that bees are good. They pollinate flowers and make honey. This guy was just resting and wouldn’t sting her unless she angered him. Made sense. And growing up, I remembered that lesson and ignored bees when they came around. I didn’t hit them and they didn’t sting me. It was a perfect arrangement. After what seemed like forever, the bee did fly off, and we went about our day. As an adult, I reminded my mom of that event and to my surprise she told me she was scared out of her mind that the bee had landed on her. She didn’t want to make a negative impression and give me a lifelong fear of bees so she remained calm. Funny, I’d been thinking of getting a bee tattooed on my thigh to remind me about my mom’s common sense that day and how I should also not be afraid of things. Now, the bee symbolizes a whole lot more. It’s also about keeping calm when things get scary. “Calmon sense” if you will. 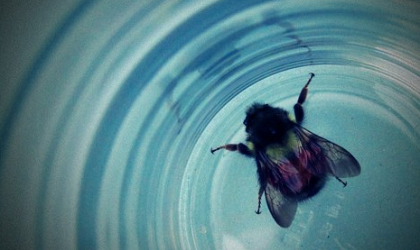 This past March, a bumble bee flew into my home. What she was doing outside on such a cold day is beyond me. I caught her in a glass, photographed her, and let her go. This, I felt, was a sign. Time to get the tattoo. It took me another month or so to find an artist. I chose Suzy Todd from Two Birds Tattoo. I booked an appointment for early June. Suzy was fantastic. She drew a bee based on my bee photo and tattooed it on my thigh, exactly where the bee landed on my mom so many years ago. I’ve been waiting to show you. It’s ready now. It’s a life-size bee tattoo, so it’s not very big. Perhaps the size of a quarter. It’s a great reminder of what my mom taught me about nature (that it’s important), and what she kept to herself (that she was scared). Now, when I’m worried about something, or scared, I think of remaining calm in spite of my fears. I am reminded to live beyond my fear. You’ll see the bee (in relation to the rest of my leg) in future outfit posts when I wear shorts or minis. The only problem now is that the bee is all alone. I think I might need to give her some tattoo flowers soon. OMIGOSH…ok, this is a beautiful post, Jean. My too favorite things family and tattoos. Gawsh, Moms are so amazing, your story got me all teary for my mom and her strength despite being a single mom most of the time and going to school and working 2 jobs when we were younger, we never knew because she was so seemingly fearless. Love this post. Thanks Jamillah! I’m glad you liked the post. Your mom sounds like a wonderful person: strong, determined, and full of love. Thanks for sharing.